Yesterday, we reported that Sony's upcoming Xperia XZ4 would come packing some tasty specs, including an upgraded 52-megapixel camera, which would make it the best of any smartphone. That camera set-up was also reported to include a ToF (time of flight) sensor, which would measure depth by sending out pulses of light and timing how long those pulses take to bounce back to the sensor. This would allow the camera to pick multiple focal points in an image to apply different effects, such as bokeh. Sony is calling this technology DepthSense and it's just released a video showing how it could be used, which you can watch below. The video shows DepthSense being used to add layers of augmented reality over everyday objects. 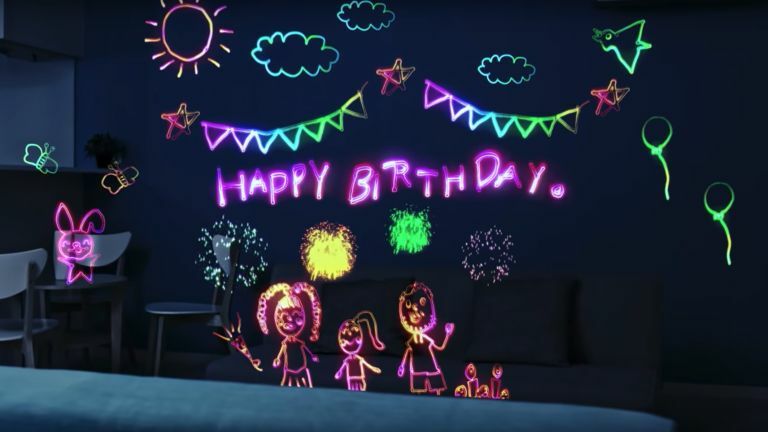 A man looks in awe at virtual birthday messages that have been left in his living room by his daughter, a teenager captions her selfies with 3D lettering, and a group of friends battle flying AR monsters while taking cover behind the sofa. Sony also shows how DepthSense could be used when shopping online, as a store would be able to photograph an object – a red handbag in this example, which DepthSense would then accurately measure the dimensions of – and then a recipient could view that object as an AR overlay (on their coffee table, for example) in their own surroundings, holding up objects against it to see how they look together. It's an intriguing system we're really interested to see what DepthSense means for photos taken by the new Sony handsets. We're expecting the Sony Xperia XZ4 to be announced at MWC 2019 at the end of February so if the tech does debut on that handset, then we'll let you know what it's like.